The province of Tehran with an area of ​​13692 square kilometers is considered as the 29th province of Iran in terms of size. 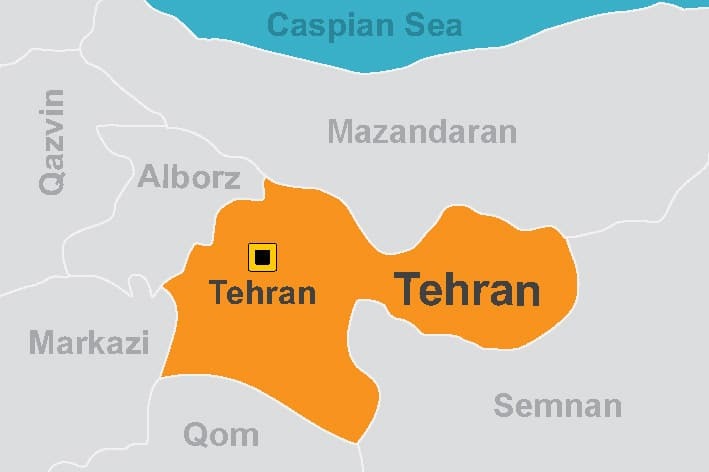 The center of the province is city of Tehran and it neighbors the provinces of Mazandaran, Alborz, Semnan, Markazi and Qom. 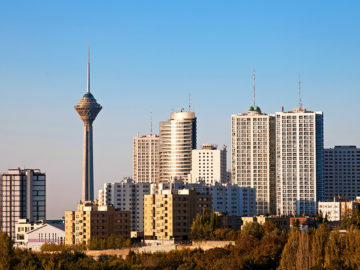 Tehran is the capital of Iran and the most populated city of the country. The province of Tehran has 16 counties and the common language is Farsi. Major immigrants are among Azeri and Mazandarani folks. The mountains of central Alborz cover the north of Tehran with important mountains and summits. Because of its natural situation, Tehran has a considerable diversity of climate and by the decrease of elevation from north to the south of province, the air temperature and rainfall reduces. Tehran Province is one of the oldest areas of Iran’s central plateau. Inhabitation in this area dates back to the pre-Islamic period, the time of Medes. In most of the historical eras, the most important city of the region was Ray that was near the city of Tehran and is part of the Tehran Province now. In the past, Tehran was actually a large village located between Rey and the foothills of Alborz. By the commencement of Safavid dynasty and the neighboring of Imāmzādeh Hamzah tomb-ancestor of Safavid- and the holy shrine of Abd al-Azim al-Hasani, Tehran came to the attention of the Shiite Safavid rulers. The Safavid king used to accommodate in Tehran once they came to the Shrine of their ancestor in Ray. The expansion of traveling to Ray convinced Shah Tahmasp Safavid to build watchtowers and fortification for Tehran. During Afsharid period, the significance of Tehran increased and then Karim Khan Zand turned it into the center of his government for four years and it was eventually chosen as the capital of Iran in Qajar era by Aqa Mohammad Khan, the first Qajar king and called it “Dar al-Khelafeh” which means capital of a country. With the increasing power of the Qajar government, Tehran’s quantitative and qualitative development began and has been continuing to the present. Tehran is full of natural and mountainous attractions. The Ski resorts of Tochal, Shemshak and Darband Sar attract many fans of winter sports. The Golestan Palace, remained from Zand and Qajar dynasty whose antiquity dates back to 440 years ago and was the house of many Qajar kings which observed great historical events, was registered at the UNESCO World Heritage Sites and it is one of the most important attractions of the city of Tehran. A collection of more than 30 diverse museums with valuable collections is built in Tehran. The National Museum with two sections of Ancient Iran and the Islamic Museum is the main museum of Tehran. The Museum of National Treasury and the Carpet Museum are other popular museums of Tehran. Azadi Tower, Tehran Bazaar, Milad Tower Cultural Complex, and Sa’dabad Museum-palace attract many visitors each year. The city of Ray has its own history and attractions as well including Abd al-Azim al-Hasani shrine, Tughrul Tower and Cheshmeh-Ali. Among the various handicrafts of the province, it can be pointed out to the art of Vitreous enamel (Minakari), weaving Jajim, wood products and woodturning, glass and leather paintings can be named. Native foods are different kinds of kebab, Dizy (Abgoosht, Meat Stew), Ash-e-Dandani (a kind of dish which is cooked once a baby is teething), Ash-e-Zeinolabedin, Bozbash and Dampokhtak (dried broad beans and rice). Zakariyyā al-Rāzī (scientist), Jahān Pahlevān Takhti (wrestler), Fereydoon Moshiri (poet) and Ali Akbar Dehkhoda (linguist) are among the celebrities of Tehran province.